On November 28, 2018, the Red Wednesday took place in the Czech Republic for the first time to support people persecuted for their faith. Several buildings were illuminated with red light and people remembered the persecuted during prayers, lectures, schools programs and happenings throughout the country. Various churches and religious communities took part in the event. “On Red Wednesday we want to draw the public attention to the people persecuted for their faith. Its symbol is a light in red, which is the color of martyrs,” said Father Stanislav Přibyl, secretary general of the Czech Bishops’ Conference, about the event originated in the United Kingdom. The main part of the program was organized on Wednesday evening in Prague and joined by people in larger cities, such as Brno, Olomouc and Liberec, as well as in smaller communities, like Koclířov, a seat of the Fatima Apostolate in the Czech Republic, or Velehrad, a Moravian place of pilgrimage. Besides Catholic parishes, participating were Evangelical, Hussite and Methodist parishes. Several buildings shined with a red light for the first time: churches of St. Nicholas and St. Havel in Prague, the Old New Synagogue in Prague as well as the Mahen Theatre in Brno or churches in several places all over Czechia. In Prague, the program offered also a conference focused on the role of religions and Churches in the society together with a presentation of the new Report on Religious Freedom in the World (2018) as prepared by the Aid to the Church in Need (ACN). “61% of the world population lives in countries where religious freedom is not respected. The ACN registered serious violations of religious freedom in 38 countries,” said Mark von Riedermann from ACN International. The secretary of the Federation of Jewish Communities in the Czech Republic, Tomáš Kraus, spoke about current antisemitism. “The situation in this regard is quite extraordinary in our country, because there are only sporadic cases of violence, mostly verbal attacks via internet. However, in Europe and the entire world it is different,” he said. Pavel Pokorný, representing the Ecumenical Council of Churches in the Czech Republic, underlined the irreplaceable role of Churches and religions in the social field. Jan Royt from the Charles University then summarized the arts as means of communication between man and God. A unique Christian-Jewish prayer also took place during the conference, offered for those persecuted because of faith and conscience. 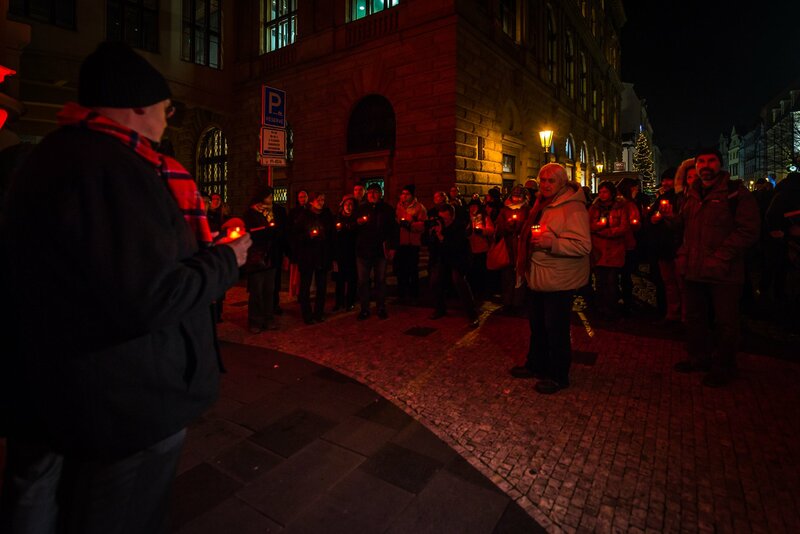 The event attended by Rabbi Ron Hoffberg from USA, Cardinal Dominik Duka and president of the Ecumenical Council of Churches Daniel Ženatý, was followed by a procession with red candles through the streets of Prague together with illuminating of the Catholic church of St. Havel, Hussite church of St. Nicholas and the Old New Synagogue in red light. As Bishop Václav Malý underlined in the introduction to this part of the program, “the awareness of our Jewish and Christian communities about the persecuted must be still deepened so that it entered into our everyday prayer,” adding that the Red Wednesday was a good opportunity and inspiration.